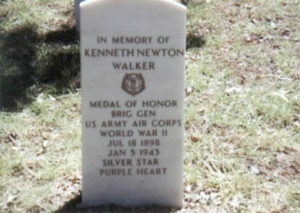 Kenneth N. Walker’s legacy is memorialized at Manila American Cemetery and Arlington Cemetery. Also, Walker AFB, Walker Hall at Maxwell AFB, the Walker Papers and the Walker Award are named in his honor. 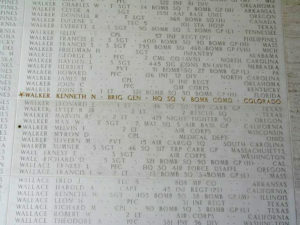 Kenneth N. Walker is memorialized on the tablets of the missing at Manila American Cemetery. His name has a gold inlay indicating he earned the Medal of Honor. During January 1948, Roswell Army Air Field (Roswell AAF) in Roswell, New Mexico was renamed Walker Air Force Base (Walker AFB) in honor of Walker. The base closed on June 30, 1967. At Maxwell Air Force Base, “Walker Hall” and the “Walker Air Power Room” at the College of Aerospace Doctrine Research and Education are named in honor of Walker. The Walker Papers is a U. S. Air Force Fellows program that annually honors the top three research papers produced by Air Force Fellows, awarding them the Walker Series award from the Air Force Research Institute. On December 7, 2001 a memorial marker for Walker was dedicated at Arlington National Cemetery at section MC Site 36-M.